Leading Manufacturer of drum filling machine, honey filling machine, hot liquid filling machine, lubricant oil filling machine, mineral water filling machine and oral liquid filling machine from Ahmedabad. 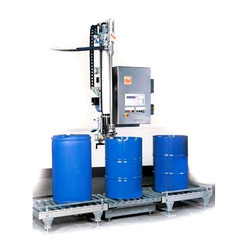 Automatic Drum Filling Machine for filling Pallets this is semi Automatic machine with intermediate features and automation please contact us for further information. We are the manufacturer of Honey Filling Machine with complete SS 304 Structure Piston Based Filling Technology. 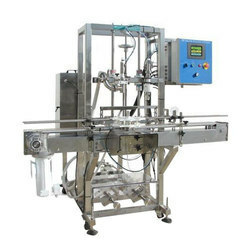 This equipment is Hot Liquid Filling Machine three in one machine. It’s of many advantages, such as compact structure, perfect control system and easy to be operated. Advanced touch screen and PLC control system makes man-machine communication true. Washing part is mainly composed of washing pump, bottle clamps, water distributor, up turn-plate, guide rail, protection cover, the spraying device, defrosting tray, rinse water take and rinse water refluxing tank. Filling Part is mainly composed of filling the tank, filling valves (hot and pressure filling), bottle hanging device/bottle pedestals, elevating device, liquid indicator, pressure gauge, filling pump, vacuum pump, etc. Capping part is mainly composed of capping heads, cap loader (separated), cap unscrambler, cap drop rail, pressure regular, cylinder. 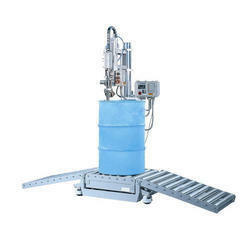 We are manufacturer and exporter of Lubricant Oil Filling Machine. 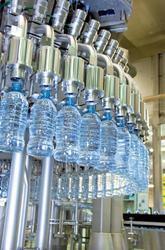 A team of highly experienced engineers works with us to manufacture the finest Mineral Water Filling Machine. The filling mechanism used in this machine is fast and accurate, which makes it the most preferred machine in the mineral water filling machinery. The modern and innovation led technique used in this machine differentiate us from our competitors in the industry. 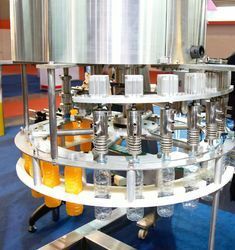 We are manufacturing Oral Liquid Filling Machine Two Head to Six Head with Customized Solution and cost-effective technology. We have exported this machine to Middle East African And Nigeria regularly. please do contact us for further technical discussion. 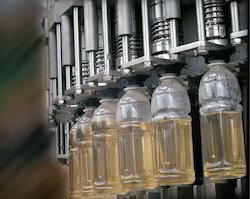 We are the manufacturer of Automatic Monoblock 3 in 1 Pet Bottle Rinsing Filling and Packing Machine with an output speed of 28 Bottles Per Minute. 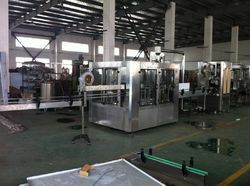 We are offering Alcohol Filling Machine to our clients. 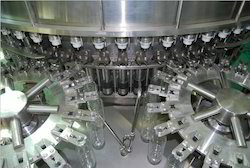 Under the able supervision of trained professionals, we offer an ample range of Automatic Rotary Bottle Filling Machine. Inattention to sustain the quality of the products, we have installed high- tech machinery and equipment for the process of manufacturing this Machine. Main motor, air conveyor motor, washing motor, and outfeed conveyor motor produces efficient and prolonged operation. The filling range is about 500 ml to 2 liters which provides fine rinsing. We are the manufacturer of u type of Conveyor Drum Filling Machine for all kinds of industries as per the customized requirements of the individual company. 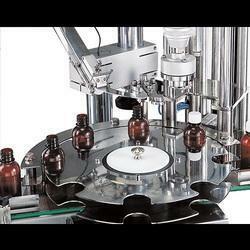 We are manufacturing Automatic Injectable Liquid Filling with Rubber Stoppering Machine. Servo Motor is used for sealing and Stoppering is done through Vaccum only. we would like to request you to kindly contact us for further Technical Description and Features. 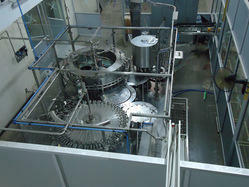 We are manufacturing Alcohol Filling Machine with Complete Automation of Rinsing Filling and ROPP Capping. 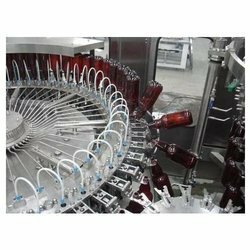 we are the leading manufacturer and supplier of a wide range of Automatic 3-in-1 Water Bottle Filling Machine that is used for different packaging applications in industrial as well as commercial areas. 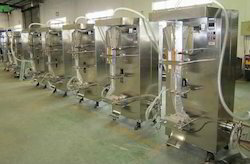 The offered filling machine is well manufactured by our skilled professionals using the latest technology and premium quality of raw material. We offer this range to our clients in varied specifications as per the requirements of our clients. Moreover, the machine we provide can be easily availed from us at affordable prices. 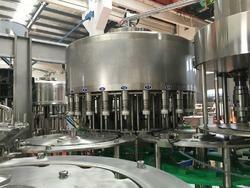 We are manufacturing Beverages Filling Machine with Hi-Tech Technology and Advanced Filling and Capping Mechanism. We have exported this machine to Turkey, Jordan, Iran, Taiwan, Japan, Russia, Saudi Arabia, UAE and other few countries. Please do contact us for further information about our products. 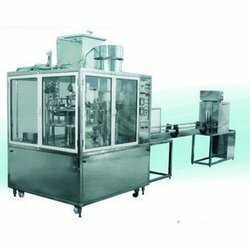 We are manufacturing Automatic High-Speed Viscous Product Filling Machine for filling highly viscous product like JAM JELL CASTOR OIL etc. We have exported this machine to Nigeria, Kuwait, Saudi Arabia, UAE, Sikkim, and Latin American Countries. Please do contact us for further Techno Commercial Discussion. We are one of the well-known manufacturers and suppliers of Mineral Water Filling Machine. 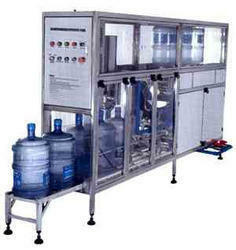 Our firm offers an enticing array of Packaged Drinking Water Filling Machine. These machines are available to our clients at highly cost-effective prices and in customized forms based on their required specifications. We are renowned as the foremost MANUFACTURER AND SUPPLIER of the high-quality Packaged Drinking Water Filling Machine. We are manufacturing Sterile Liquid Filling with Rubber Stoppering Machine with an output speed of 120 and 240 Vials Per Minute. 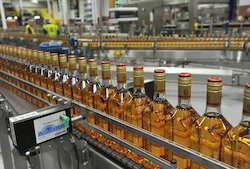 Servo Based Technology is used for filling Liquid hence we are getting perfect accuracy for filling. We have exported this machine to Bangladesh Iran Myanmar, Saudi Arabia, Pakistan Nepal, and Brazil. Please do contact us for further Technical Description and Features. We are offering Water Filling Machine to our clients. We are the manufacturer of Automatic Mineral Water Filling Machine of very robust quality and supplying to overseas countries we have production speed of 30 BPM TO 120 BPM. Material SS 304 frame structure. 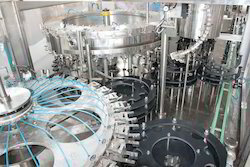 The Jar filling line is a clean and efficient solution for a modern filling plant. It involves a JAR Rinsing, filling and capping machine. 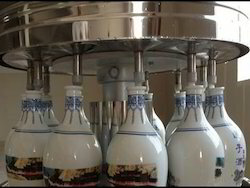 The brushing machine is manually operated but the Rinser, Filler, and Capper are automated after bottle loading. 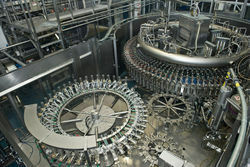 The rinser involves a THREE stage rinsing system that will use detergent water to clean and treated water to rinse the inside of the jar. The outside of the jar is cleaned by the jar brushing machine. All the water in the jar or any that is accumulated on the body is allowed to drain off. The jar is tilted 180 during the entire rinsing cycle, after draining the water, it is righted once more and sent to the filler. The filler nozzle is controlled pneumatically; It enters the mouth and fills up to a pre-set exact volume. The filling level is controlled by an electronic level controller. The Jar then passes under the cap dispenser where it will. 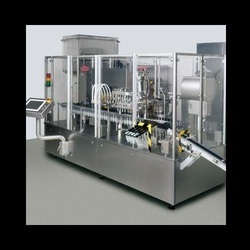 Automatic 20-liter Jar Rinsing, Filling and Capping Machine. Fully automatic linear PLC based on 20 ltr. Jar/Bubble top. Out Put Speed of 100 jars per hour. Pressure Pump Wash ensures proper washing. Diving Type filling nozzle ensures no spillage of water, timing base filling system. Cap Pressing by pneumatic cylinder for proper capping. 9 Feet length/7.5 feet height and 3 feed with. 2.0 HP for washing and filling / 1.0 HP for the conveyor. The machine can be tailor - made as per floor space availability. UV sterilization for caps before capping operations. Screw or press-fit capping can also be done. The machine can be tailor made as per floor space availability. 2.0 HP Compressed air and 3 HP Power Utility Required. We are the manufacturer of Rotary Filler Machine. 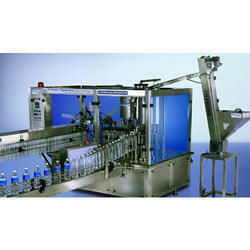 We are leading manufacturer of Soda Filling Machine. We are offering Sparkling Water Filling Machine to our clients. 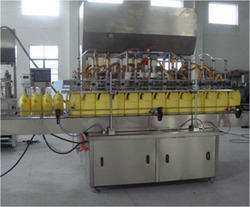 We are offering Servo Filling Machine to our clients. 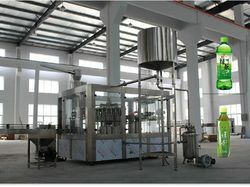 We are offering Pet Bottle Filling Machine to our clients. We are offering Soda Filling Machine to our clients.